Amalek's Terrorists, Traitors, and Collaborators. A Hasidic analysis of World War III, including news reports; penetrating, in-depth analyses; and an overview of world events. Based on Torah prophecy, viewed through the lens of Hasidus. A weekly five-minute audio podcast analyzing and discussing current events from a Hasidic perspective. JAHG-USA's campaign to end U.S. funding of the PLO terrorist organization, with a growing list of hundreds of endorsing rabbis and non-Jewish leaders. Brand new! The Noahide Laws detailed, unlike anywhere else. This site is in progress, so continue to check back. The 1917 Jewish Publication Society English translation of the Tanach (Hebrew scriptures) in ASCII text format (the package is in a zipped archive). Also provides links to other Torah sources. "All 24 books of the Torah, Prophets, and Writings are now at your fingertips in one magnificent 2,200 page volume, as interpreted by the classic sages of Talmudic and Rabbinic literature. This is a remarkable achievement. It enables everyone to obtain a basic knowledge of the entire Tanach from 'In the beginning' to the return to Eretz Yisrael.... Edited by Rabbi Nosson Scherman in collaboration with an international team of scholars" [this description from Mesorah Publications, the publisher]. "The entire Chumash [five books of Moses], newly reset, in one beautiful volume with a new, contemporary English translation of the Torah, faithful to Rashi and the classic Rabbinic commentators, and an anthologized commentary by a team of scholars, under the editorship of Rabbi Nosson Scherman. This commentary draws on the spectrum of biblical commentaries, from the Talmud, Midrash, and the classic Rabbinic commentators, and includes insights of contemporary greats" [this description from Mesorah Publications, the publisher]. "A well-lit and accesible gateway to Tanya, and the most authoritative guide to its riches. A linear exposition and commentary on Tanya based on a popular weekly radio series in Yiddish. Rabbi Wineberg's commentary draws upon the teachings he received from Chasidic scholars at the renowned academies of Lubavitch in Europe and the writings of seven generations of Chabad Rebbes. Each of the lectures was examined and amended by the Lubavitcher Rebbe, Rabbi Menachem M. Schneerson, so that much of the material includes the Rebbe's insights and explanatory comments. 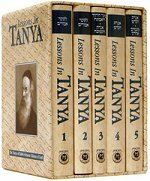 Lessons in Tanya leads the reader through every paragraph and page, illuminating the mystical, often allusive, Talmudic, Kabbalistic, and Scriptural verses and concepts. It fills many gaps in what the terse Tanya text assumes to be the reader's background knowledge" [this description from the Kehot Publication Society, the publisher]. "Pirkei Avos ("Chapters of the Fathers") is usually called 'Ethics of the Fathers'.... The Talmudic Sages called it simply Fathers—or, better said, parents—because it is the guide to behavior, attitudes, civility, honor, integrity, faith, aspiration, and much more.... In Pirkei Avos we sit at the feet of the spiritual giants who guided [Israel] through five turbulent centuries. If the Jewish people has taught the world about faith, kindness, sensitivity, and all the values that society lumps under the rubric of 'civilization,' it is because it learned those lessons from the 'fathers' whose teachings are recorded in this magnificent volume.... Pirkei Avos is illuminated with a commentary anthologized from two thousand years of Rabbinic literature".... [this description from Mesorah Publications, the publisher]. Generate a calendar of Jewish holidays for any year 0001-9999. Convert between dates on the Hebrew and Gregorian calendars. Weekly Shabbos candle lighting times, weekly Torah readings, and much more. Calculate the sunrise and sunset times for U.S. cities and other locations throughout the world. Data are presented as a table with times for any month of any year. Useful for Jewish Shabbos observance, daily prayers, and other mitzvos that depend on time of day.